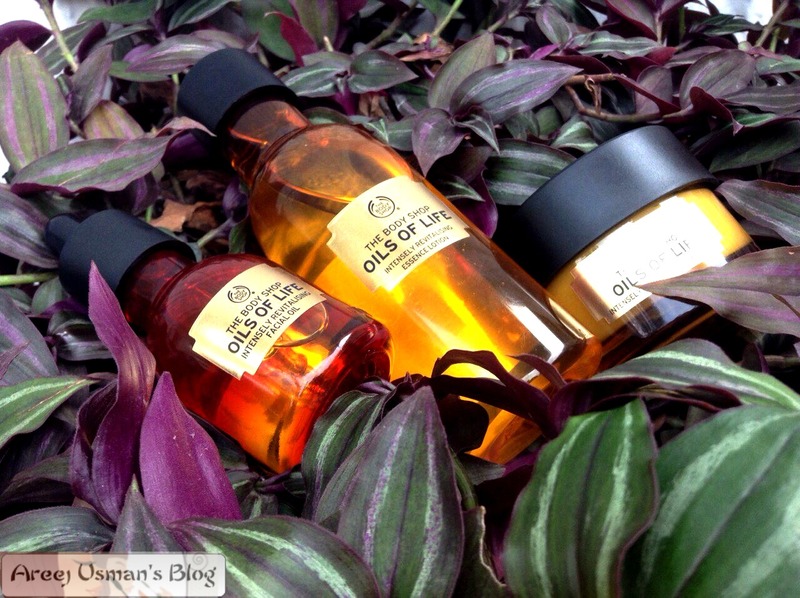 So Girls as I mentioned in my Oils Of Life launch and range post, I ll be reviewing the main three products from this range this month & so the first review from the series is here.The product that I am reviewing today is the OILS OF LIFE Intensely Revitalizing Facial Oil by The Body Shop. 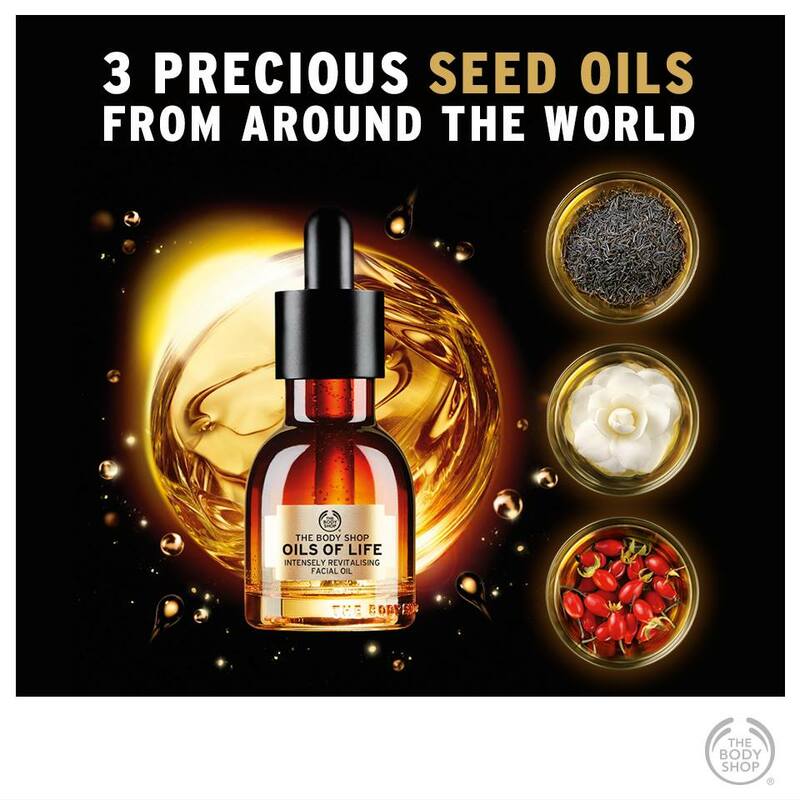 By infusing 3 precious seed oils from around the world, known for their revitalising and repairing properties on skin – Black Cumin seed oil from Egypt, Camellia seed oil from China and Rosehip seed oil from Chile – with a powerful blend of essential oils, we created a lightweight daily facial oil to intensely revitalise skin, instantly replenish moisture and revive radiance. Signs of ageing appear visibly reduced. 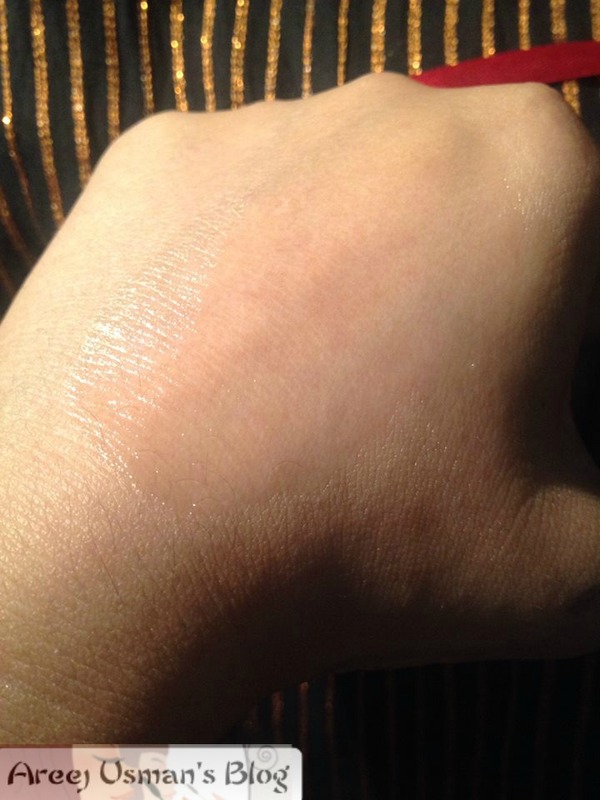 Made from 99% oils of natural origin, this lightweight, quickly-absorbed formula effortlessly melts onto skin leaving a non-sticky, velvety-soft finish. 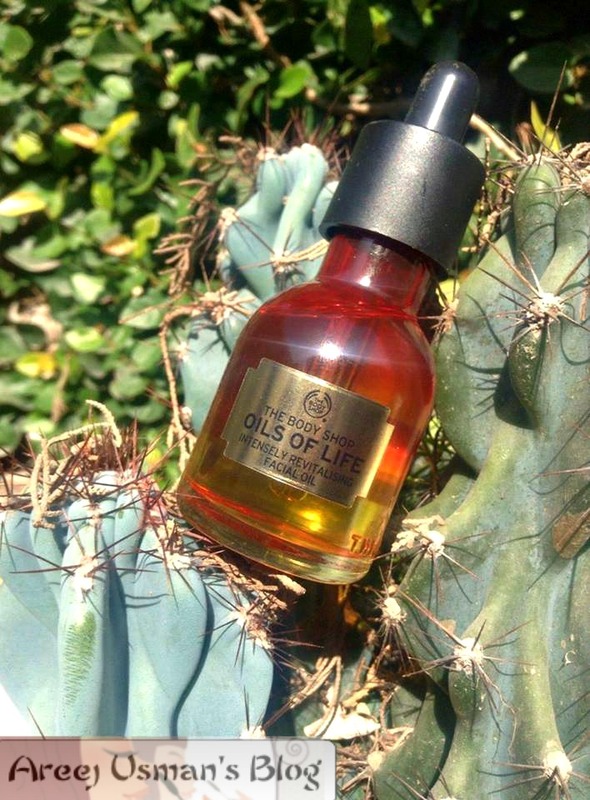 The power of facial oils: 6 oil myths busted! 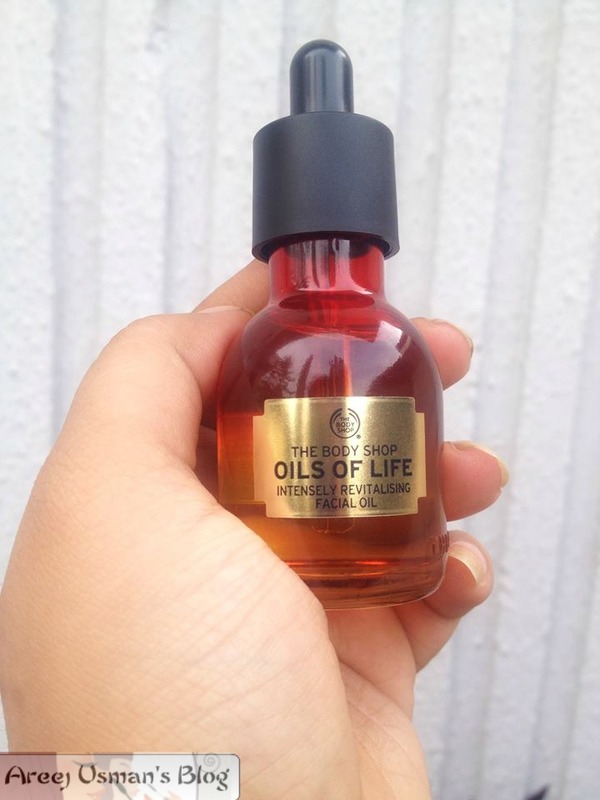 Well the first thing that comes into my mind when I think about a facial oil is that is it ok for a person like me who has oily skin to use this product,Well the myth is now busted and I ll explain gradually how that happens. 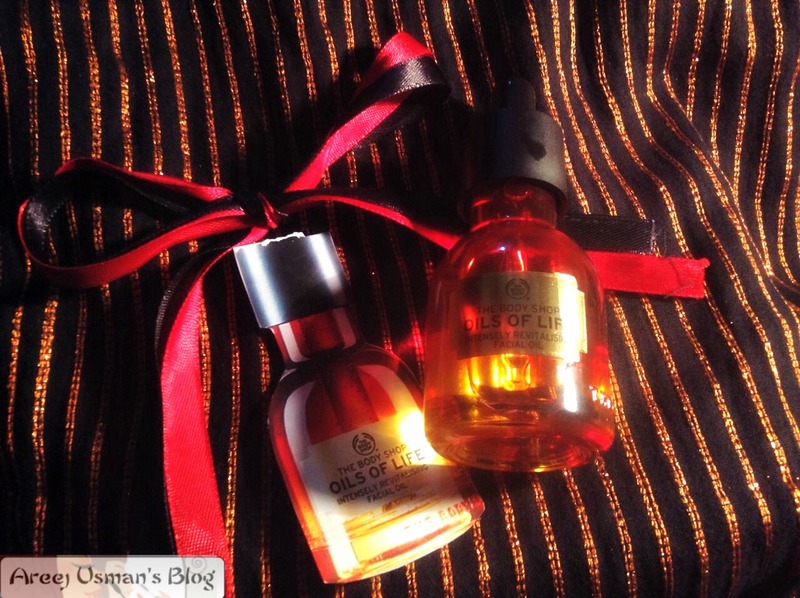 I recieved this cute looking little bottle that fits perfectly in the palm of my hands from The Body Shop Pakistan for review purpose and I have been using it for a week now.Its packaging is super.It is an ombre glass bottle with a glass dropper inside it.It looks really alluring & one is tempted to try what is within. 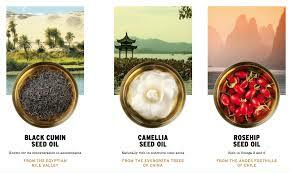 The consistency of the oil is not very thick and oily like usual oils.It has s somewhat runny consistency.The scent of the oil is very luxe and mostly it gives the feeling of a spa.As spa is usually associated with burning fragrance oils.This brings in aromatherapy.The body shop has developed these products keeping in mind the relaxment and mood enhancing that comes from aromatherapy.I am loving the scent of this oil.It is very light though it is a combination of oils basically. It is advised to use only a drop or two everytime we use the facial oil.I pour two drops of this facial oil and massage my face in the morning and night with it.If I apply it in the morning it keeps my face supple and bright all day.I have even tried it as a primer for face powder & believe me it settled the powder perfectly.Within a minute the oil is absorbed into the skin & leaves a non-greasy but soft skin to the touch.The skin feels hydrated for several hours.As the winters are approaching and usually the winters a bit harsh in Islamabad,I am looking forward to noursish and moisturize my skin with the help of this facial oil. 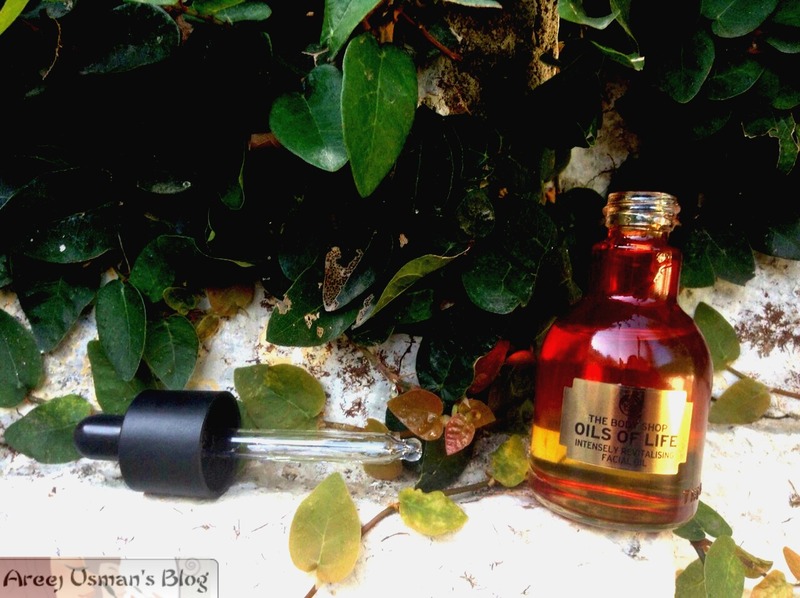 The color of the oil is light yellow too.Its mainly the ombre designed amber colored bottle that gives us the feeling of a dark colored liquid in it. 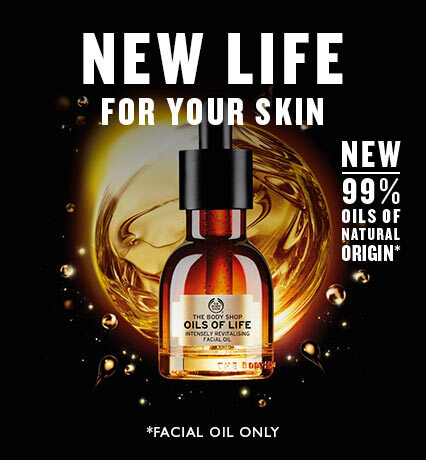 Overall this product has highly impressed me.It is for all those who are looking for a good facial oil with 99% oils only.It is a very natural product.If you apply it in the morning,it will keep your face nourished and oxidated.In the night it will help rebuild the skin for fresher looking skin the next morning.If used for a longer period of time it may reduce the signs of pre mature aging and keep the skin more healthier & maintain the healthy pH balance of skin. 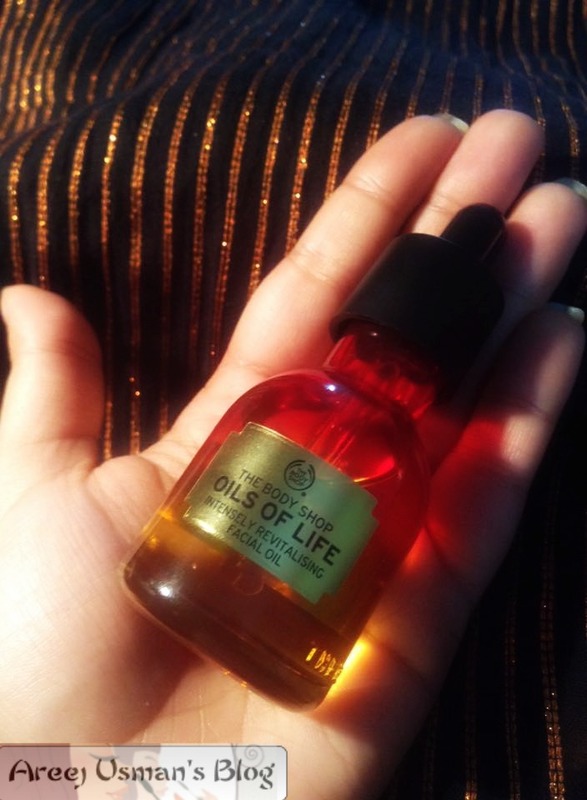 This 30 ml bottle is priced at Rs.5130 which may seem pricier in the start.But when you give it a serious thought its all natural products in there and also that a little goes a long way. 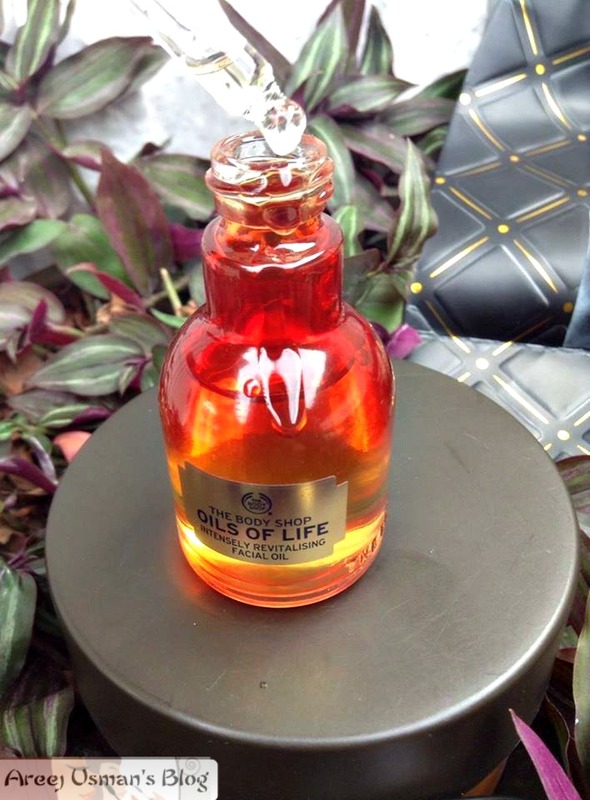 All the OILS OF LIFE range is now available at The Body Shop stores nationwide. 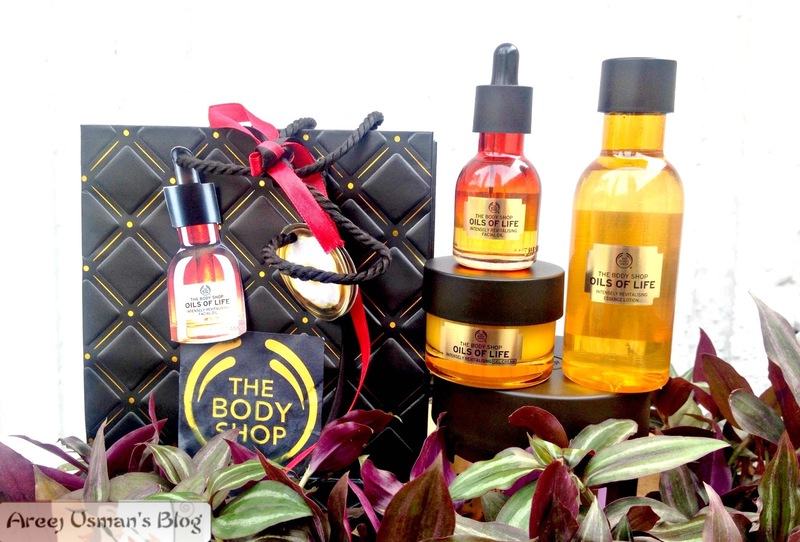 For more details and updates,visit The Body Shop Pakistan’s Official Facebook page. Such a great detailed review 🙂 very nice!